I’ve been saying for a while now that it would be a dream come true to have director Peter Jackson’s first post-Hobbit directorial gig be a motion picture in the vein of his earliest grindhouse works, most notably Meet the Feebles, something demented, warped and low-budget. Wouldn’t it be great to see that side of Jackson again after so many years of only seeing him use his filmmaking skills on big-budget productions? Well, it turns out his actual first directorial effort after those Hobbit movies is something far removed from the likes of Meet the Feebles but that’s not at all a bad thing. 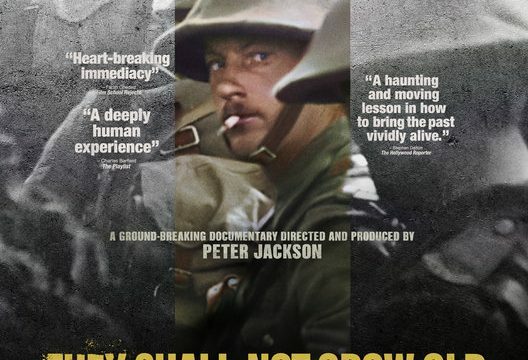 On the contrary, They Shall Not Grow Old feels like a return to form for Jackson as he uses groundbreaking VFX in the service of human beings and not the other way around for the first time in ages. They Shall Not Grow Old chronicles the experiences of World War I soldiers via voice-over testimonies from soldiers who were actually there on the front lines of battle accompanied by footage from World War I that starts out looking like standard footage from the 1910’s as it’s rendered in black-and-white and in a tiny aspect ratio that contains the footage in a small box in the middle of the screen. Once the soldiers travel overseas, however, much like how Dorothy stepped into full Technicolor once she first arrived in Oz, the on-screen images blossom into a wider aspect ratio that fills up the entire screen with fully colorized images as well as newly created sound and vocal work that make sure each tank carries an intimidating rumble and every soldier has a voice within the footage. If you’ve seen the trailers for They Shall Not Grow Old, you’ve likely seen this impressive visual effects wizardry already but it’s still a sight to behold on the big screen in the context of the film. Aside from a handful of minor technical gaffes (like one fellow in the footage whose audio doesn’t quite match up to his lips), it’s an impressive achievement that makes the world that these soldiers experienced feel all the more visceral. 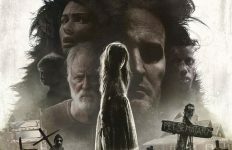 Even the 3D, a technique that seems to have faded away once again after generating so much hype at the dawn of the decade, is put to good use here throughout as a way of capturing subtle pieces of depth in the old-timey images. Even the initial black-and-white segments get some fine mileage out of the third dimension since the 3D makes the square aspect ratio feel like a literal window that one could poke their head out of to get a better look at the black-and-white exterior outside. In perhaps the greatest piece of praise one could offer They Shall Not Grow Old, one forgets they’re even watching painstakingly restored archival footage after a while, the images and accompanying anecdotes from the soldiers are so engrossing that one can forget all the technical prowess on display. Much of that comes down to the effective nature of the various stories told by way of voice-over the people who were there in the trenches of No Man’s Land. Recorded years after they stepped off the battlefield, these gentlemen have all got tales to tell about being normal people, some as young as 15, being brought into a war where they would, more likely than not, have to put their own lives on the line. One of the most fascinating parts in how the recounting of their stories is the anecdote from British soldiers about how they and the enemy troops they were fighting shared a common sentiment of not understanding the war they were fighting, the reasons they were sacrificing themselves was a mystery to them both. Both these British soldiers and their adversaries were caught up in the grander sweep of history and that’s communicated nicely by both the wider aspect ratio and the level of detail one can finally see in the newly restored footage. That footage frequently depicts World War I soldiers being dwarfed by just their surroundings and in other cases being even greatly outmatched in sizes by explosions caused enemy weaponry. In this manner and in numerous other ways, They Shall Not Grow Old uses the technology at its disposal to provide an exceptional visual accompaniment to the stories of actual World War I soldiers. In a nice extra touch, the Fathom Event screening I attended of this feature was followed up by a featurette chronicling how this archival footage was brought to life in this way and it’s truly impressive to see all the work that went into this project, particularly in terms of the soundwork which adds a level of realistic detail one might just take for granted while watching the movie. All of the hard work has certainly paid off, They Shall Not Grow Old is an excellent example of how to use modern technology to brilliantly explore the past.